Gather with family and friends in the Pool Clubhouse featuring a splash fountain, play ground area, tiki hut bars, picnic tables and BBQ grills. Located approximately 1 mile from the quaint Anna Maria Island with beautiful crisp white beaches, boutiques and restaurants.This spacious condo is newly furnished and comfortably sleeps 6 adults with a platinum queen mattress sofa sleeper.Open floor plan enhances entertaining with a dining table that seats 6 and a large kitchen island with granite top and bar stools. 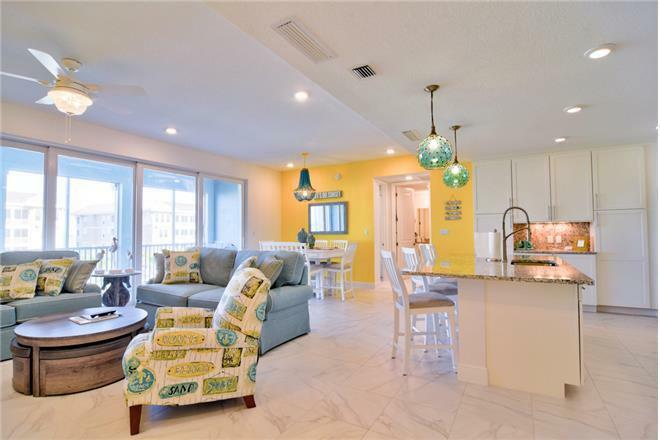 You may also enjoy dining or relaxing on the spacious lanai watching the beautiful sunsets. The kitchen has upgraded stainless steel appliances that includes a dishwasher and stackable washer and dryer featuring granite countertops. Gather in the living area to watch the 65 TV or play games on the coffee table with 4 stools that are full of games for all ages. Unwind from a day at the pool or beach in the coziness of a sofa sleeper, loveseat or recliner. Both bedrooms are decorated with fun sophistication. The master has a king size bed, 50 TV and walk in closet. The master bath has a walk-in shower and granite top double vanity sink. The guest room has a queen bed and 50 TV. The second bath has a tub/shower combo and granite top vanity. Enjoy amenities such as high speed WiFi, cable TV, Margaritaville Frozen Concoction Machine, luxurious towels and linens. Take pleasure visiting local areas such as Anna Marie Island, historical Downtown Bradenton and the rich arts district of Sarasota. Enjoy the quaint feel of Anna Maria Island by spending the day browsing adorable boutiques, delighting in enjoyment of the many restaurants or simply basking in some fun in the sun on the white powdery beaches. Downtown Bradenton offers a park winding along the Manatee River, galleries, museums,aquarium, planetarium, performing arts center and much more! Sarasotas art district is home to the Sarasota Opera, Florida Studio Theater and much more. Regardless of how you choose to pace your vacation, may it be filled with fun activities, sightseeing, relaxing or a combination of all mentioned. We are certain it will be hard to leave this ultimate vacation retreat; however, you most certainly will return home relaxed and rejuvenated! *Sorry, no smoking or pets allowed"